Discussion in 'The STAGE48 Idol Emporium' started by steph, Jun 12, 2018. Yoshioka Mayu (吉岡 茉祐) is a voice actress affiliated with the agency 81 Produce. Her nickname is Mayu-shii (まゆしぃ). She is the center of Wake Up, Girls!. She voices Shimada Mayu (島田真夢) who is the main protagonist in the Wake Up, Girls! anime franchise. In the anime, she is a former member/center of the first generation I-1club. Her image colour is red and her image animal is a lion. She is also a member of idol group D-Selections along with fellow WUG member Aoyama Yoshino. Aoyama Yoshino (青山 吉能) is a voice actress affiliated with the agency 81 Produce. Her nickname is Yoppii (よっぴー). She is the leader of Wake Up, Girls!. She voices Nanase Yoshino (七瀬佳乃) in the Wake Up, Girls! anime franchise. Her image color is light blue and her image animal is a polar bear. She is also a member of idol group D-Selections along with fellow WUG member Yoshioka Mayu. Okuno Kaya (奥野 香耶) is a voice actress affiliated with the agency 81 Produce. Her nickname is Kayatan (かやたん). She is the second-in-command in Wake Up, Girls! after Aoyama Yoshino. She voices Kikuma Kaya (菊間夏夜) in the Wake Up, Girls! anime franchise. Her image color is green and her image animal is a crocodile. Eino Airi (永野 愛理) is a voice actress affiliated with the agency 81 Produce. Her nickname is Ai-chan (あいちゃん). She voices Hayashida Airi (林田藍里) in the Wake Up, Girls! anime franchise. Her image color is indigo and her image animal is a shark. Tanaka Minami (田中 美海) is a voice actress affiliated with the agency 81 Produce. Her nickname is Minyami (みにゃみ). She voices Katayama Minami (片山実波) in the Wake Up, Girls! anime franchise. Her image color is yellow and her image animal is a tiger. Yamashita Nanami (山下七海) is a voice actress affiliated with the agency 81 Produce. Her nickname is Nanamin (ななみん). She voices Hisami Nanami (久海菜々美) in the Wake Up, Girls! anime franchise. Her image color is purple and her image animal is a wolf. Takagi Miyu (高木 美佑) is a voice actress affiliated with the agency 81 Produce. Her nickname is Myuu (みゅー). She voices Okamoto Miyu (岡本未夕) in the Wake Up, Girls! anime franchise. Her image color is orange and her image animal is an eagle. Doesn't this look similar to AKB48's Iiwake Maybe? Kondo Mai (近藤麻衣) is a first generation member and one of the oldest members of the I-1club at 24-years-old. Her nickname is "Maimai." She serves as the group's team captain and is very strict in maintaining their top performances and activities. She is voiced by Kato Emiri (加藤英美里). Her AKB48 counterpart is Takahashi Minami. Yoshikawa Megumi (吉川愛) is an original first-generation member of the I-1club. Her nickname is "Yoshimegu." She is one of the main I-1club characters to the Wake Up, Girls! story. Despite originally not being in the front and center as well as having gone back and forth with the I-1 and I-2 armies, she is now one of the most popular members of the club. She is voiced by Tsuda Minami (津田美波). Her AKB48 counterpart is Kashiwagi Yuki (this is one of the members I'm unsure of their similarities, yukirin is the closest resemblance I could find to her character). Suzuki Rena (鈴木玲奈) is a current second-generation member of the I-1club. Her nickname is "Ren Ren. "She is part of the "W Suzuki" duo alongside Moka Suzuki. She has the top class singing ability in the group, but it seems to be the result of hardships with repeated efforts. She is voiced by Akesaka Satomi (明坂聡美). Her AKB48 counterpart is Matsui Rena. Aizawa Nanoka (相沢菜野花) is a second-generation member of I-1club. Her nickname is "Nanokasu." She is one of the most popular members of the group because she wears glasses throughout her performances and promotions. She is voiced by Fukuhara Kaori (福原香織). Her AKB48 counterpart is Tomomi Itano (this is the other member I'm unsure of, tomochin is the closest resemblance I could find to her character. They kind of look similar if tomochin was wearing glasses). Kobayakawa Tina (小早川ティナ) is a third-generation of the I-1club and a front member of the I-1 team. Her nickname is "Ti-na." She is half-British and half-Japanese. Due to her fancy style, she is responsible for the charm of the group. She is voiced by Yasuno Kiyono (安野希世乃). Her AKB48 counterpart is Kojima Haruna (although she seems more like Shiraishi Mai from Nogizaka46). Suzuki Moka (鈴木萌歌) is a fourth generation member of I-1club and the current center. Her nickname is "Moka-ga." She is also part of the "W Suzuki" unit alongside Suzuki Rena. She is voiced by Yamamoto Nozomi (山本希望). Her AKB48 counterpart is Matsui Jurina. Takashina Rika (高科里佳) is a fifth-generation member of the I-1club and the newest member in the main seven. Her nickname is "Rikacchi" given by Iwasaki Shiho. She is voiced by Ueda Reina (上田麗奈). There isn't a specific AKB48 counterpart I can think of, but I believe she represents a majority of the new gens who admire their original gen senpais. 2. Shirts to Blouse (This song is comparable to AKB48's song Ponytail to Shushu. It is similar in terms of the title and it kinda sounds like a more cheerful version of the song). Shiho Iwasaki (岩崎志保) is the center of the group. Her nickname is "Shihocchi". She was formerly a first-generation member of I-1club. She was also the former center of I-1club after taking the role from Shimada Mayu. Despite her center spot and being one of the most popular members of I-1club, she continues to view Mayu as a rival. Her center duties for I-1club have been succeeded by Suzuki Moka. She is voiced by Ootsubo Yuka (大坪由佳). Her AKB48 counterpart is Oshima Yuko. No original albums, but appears in Wake Up, Best! 2 with the song Resurrection. Koko Hayashi (林鼓子) is a voice actress affiliated with the agency 81 Produce. She voices Hayashi Ayumi (速志 歩) in the Wake Up, Girls! franchise who is her anime counterpart. She is a big fan of Shimada Mayu. Yuka Morishima (森嶋優花) is a voice actress affiliated with 81 produce. She voices Morishima Otome (守島 音芽)in the Wake Up, Girls! franchise who is her anime counterpart. She is a dedicated fan of Wake Up, Girls!. Atsugi Nanami (厚木那奈美) is a voice actress affiliated with 81 produce. She voices Itsuka Atsugi in the Wake Up, Girls! franchise who is her anime counterpart. She is an I-1club fan. No original albums, but appears on Wake Up, Best! 3 with an original song called KakeruxKakeru. Shiraki Toru (白木徹) is the I-1club's General Manager, Producer, Company President. His goal is to push the I-1club to be the most popular Entertainment Group in Japan. He is the former producer of Saint 40 (an Onyanko club counterpart). His belief of forbidding the members to have personal relationships are based on real life instances where idols who are known or even suggested to have such relationships are either demoted or removed from their respective groups. He is voiced by Miyamoto Mitsuru (宮本充). He is the counterpart of Akimoto Yasushi. Hayasaka Tasuku (早坂相) is an A-list music producer of which the I-1club is one of his clients. He also has produced songs for Wake Up, Girls!. He is voiced by Suzumura Kenichi (鈴村健一). His counterpart is Inoue YOSHIMASA (I can't think of a specific counterpart but I believe it would be him since he has created many hit songs for AKB48. His character also reminds me a bit of Tsunku). The official website for the Wake Up, Girls! voice actress and singing unit announced on Friday that the group will disband in March 2019. The group will host a final tour, and the post assured fans that the members will continue their activities as voice actresses. The post stated the group will disband so that the members can each pursue their individual goals and dreams and so they can walk their individual paths [credit]. A link to a translation of their announcement can be found here. But to sum it up, the group itself will disband and the members will continue their voice acting careers. However, the actual "Wake Up, Girls!" project will continue (I am assuming that Run Girls, Run! are not disbanding judging from this statement but I think realistically I-1 club will also no longer release any songs). I've also listed all of their songs up above in my previous posts. I genuinely like all of the songs this franchise has released and I don't think they've ever released a bad song imo. 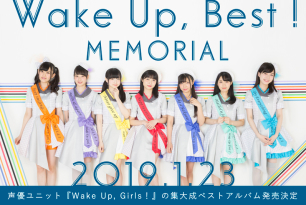 WUG will be releasing a best of album on January 23 2019 called "Wake Up, Best! MEMORIAL". It will also include 4 original songs that have not been previously released! This album, which will be a large volume of 8 sets, contains songs as a voice actor unit as well as character songs of TV anime. 言葉の結晶 (Crystal of Words) is one of the 4 original songs that WUG will release in "Wake Up, Best! MEMORIAL"
30 sec CM of "Wake Up, Best! MEMORIAL"
土曜日のフライト (Flight on Saturday) preview. The second original song on their upcoming album. Wake Up, Girls! and Run Girls, Run! have all of their songs now up on Spotify. 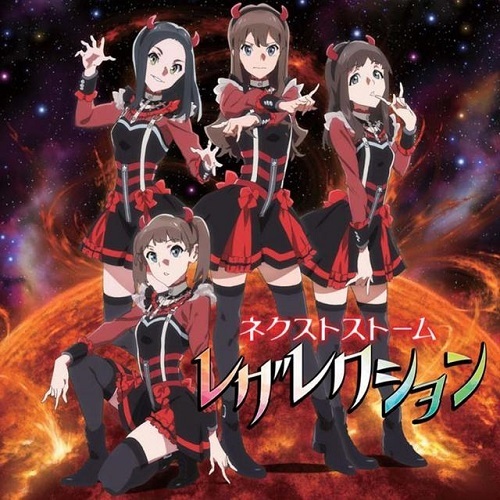 I-1 club also have most of their songs up on Spotify except for their 4th Single: Resurrection/Tomaranai Mirai.